A: Jiro seems to have a fever. Do you think we should call a doctor ? B: Did you take his temperature ? 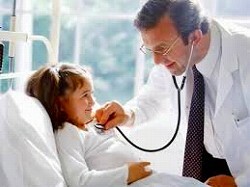 ・I called the doctor to find out if my child needs to be seen. A: Are you going to see a doctor about those stomach pains you've been having ? B: I already did. He said they’re from stress.